• Kato, Shuichi. Form, Style, and Tradition. Tokyo: Kodansha, 1971. • Koren, Leonard. Wabi-Sabi for Artists, Designers, Poets, and Philosophers. Berkeley: Stone Bridge Press, 1994. • Mason, Penelope. History of Japanese Art. New York: Abrams, 1993. • Okakura, Kakuzo. The Book of Tea. Tokyo: Kodansha, 1989. • Tusda, Noritake. Handbook of Japanese Art. 1976. Tokyo: Tuttle, 1978. • Warner, Langdon. The Enduring Art of Japan. 1952. New York: Grove, 1988. • Bring, Mitchell and Josse Wayembergh. Japanese Gardens: Design and Meaning. New York: McGraw-Hill, 1981. • Houser, Preston L. Invitation to Tea Gardens: Kyoto’s Culture Enclosed. Kyoto: Mitsumura Suiko Shoin, 1992. • Itoh, Teiji. Space and Illusion in the Japanese Garden. Trans. Ralph Friedrich and Masajiro Shimamura. New York: Weatherhill, 1983. • Kuck, Loraine. The World of the Japanese Garden: From Chinese Origins to Modern Landscape Art. 1968. New York & Tokyo: Weatherhill, 1984. • Nitschke, Gunter. The Architecture of the Japanese Garden: Right Angle and Natural Form. Koln: Benedikt Taschen, 1991. • Sakuteiki: The Book of Gardening. Trans. Shigemaru Shimoyama. Tokyo: Town and Panners, 1976. • Slawson, David A. Secret Teachings in the Art of Japanese Gardens. 1987. Tokyo: Kodansha, 1991. • Wright, Tom. Zen Gardens: Kyoto’s Nature Enclosed. Kyoto: Mitsumura Suiko Shoin, 1990. • Aston, W. G. Nihongi: Chronicles of Japan from the Earliest Times to A. D. 697. Tokyo:Tuttle, 1972. • Carter, Jon and Alan Covell. Japan’s Hidden History: Korean Impact on Japanese Culture. Seoul: Hollym, 1984. • Sansom, George. A History of Japan to 1334. Stanford, Stanford UP, 1958. • Sansom, George. A History of Japan, 1334-1615. Stanford, Stanford UP, 1958. • Sources of Japanese Tradition. Vol. 1. 1958. Comp. Ryusaku Tsunoda, Wm. Theodore De Bary, and Donald Keene. New York: Columiba UP, 1965. • Varley, Paul H. Japanese Culture: A Short History. Tokyo: Tuttle, 1973. • Durston, Dianne. Kyoto:Seven Paths to the Heart of the City. Kyoto: Mitsumura Suiko Shoin, 1987. • Mosher, Gouverneur. 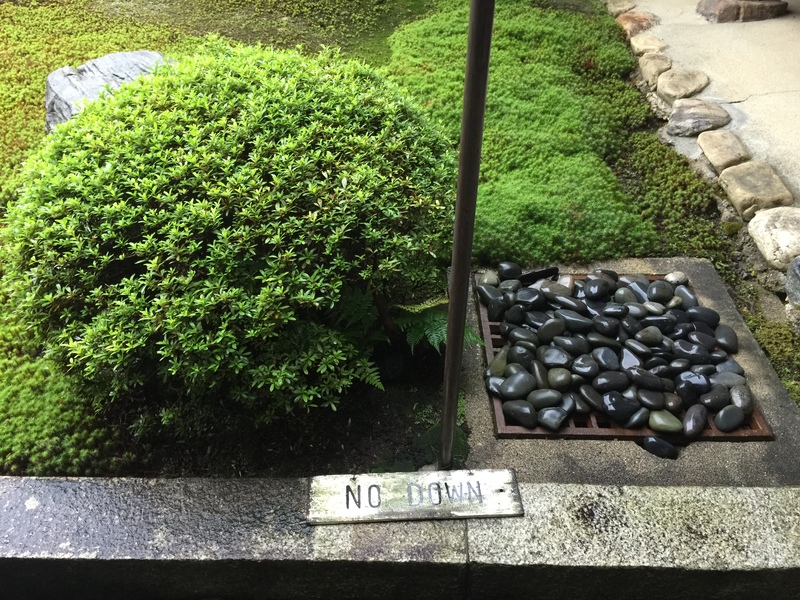 Kyoto: A Contemplative Guide. 1964. Tokyo: Tuttle, 1993. • Richie, Donald and Alexandre Georges. The Temples of Kyoto. Tokyo: Tuttle, 1995. • Rimmer, J. Thomas and Jonathan Chaves, Stephen Addiss, and Hiroyuki Suzuki. Shisendo: Hall of the Poetry Immortals. Tokyo: Weatherhill, 1991. • Stewart, Harold. By the Old Walls of Kyoto: A Year’s Cycle of Landscape Poems with Prose Commentaries. Tokyo: Weatherhill, 1981. • Treib, Marc and Ron Herman. A Guide to the Gardens of Kyoto. 1980. Tokyo: Shufunotomo, 1985. • Usui, Shiro. A Pilgrims Guide to Forty-Six Temples. Tokyo: Weatherhill, 1990. • Anthology of Japanese Literature to the Nineteenth Century. Comp. Donald Keene. London: Penguin, 1968. • Arntzen, Sonja. Ikkyu and The Crazy Cloud Anthology. Tokyo: U of Tokyo P, 1986. • Blyth, R. H. Haiku. Four Volumes. 1949. Tokyo: Hokuseido, 1981. • Blyth, R. H. A History of Haiku. Two Volumes. 1963. South San Francisco: Hokuseido, 1980. • Blyth, R. H. Zen and Zen Classics. Vol. 4. Mumonkan. 1966. South San Francisco: Hokuseido Press, 1978. • Cold Mountain: 100 Poems by the T’ang Poet Han-shan. Trans. Burton Watson. New York: Columbia UP, 1970. • Cold Mountain Poems: Twenty-Four Poems by Han-shan. Trans. Gary Snyder. 1956. Portland: Press-22, 1972. • Collected Songs of Cold Mountain. Trans. Red Pine. Port Townsend: Copper Canyon, 1983. • Hisamatsu, Senichi. The Vocabulary of Japanese Literary Aesthetics. Tokyo: Centre for East Asian Cutural Studies, 1963. • Japanese Tales. Trans. and Ed. Royall Tyler. New York: Pantheon, 1987. • Mirror for the Moon: A Selection of Poems by Saigyo (1118-1190). Trans. William LaFleur. New York: New Directions, 1978. • Manyoshu. Vol. One. Trans. Ian Hideo Levy. Princeton: Princeton UP, 1981. • Mishima, Yukio. Temple of the Golden Pavilion. 1959. Tokyo: Tuttle, 1985. • Mishima, Yukio. The Sea of Fertility. London: Penguin, 1976. • Murasaki Shikibu. The Tale of Genji. 1976. Trans. Edward G. Seidensticker. London: Secker and Warburg, 1985. • Song in the Dream of the Hermit: Selections from the Kanginshu. Trans. Yasuhiko Moriguchi and David Jenkins. Seattle: Broken Moon Press, 1994. • Tale of Genji. Trans. Edward G. Seidensticker. Tokyo: Tuttle, 1976. • Tyler, Royall. Japanese Tales. New York: Pantheon, 1987. •Watson, Burton. The Rainbow World. Seattle: Broken Moon Press, 1990. • Blyth, R. H. Zen and Zen Classics, Vol. Four, Mumonkan. 1966. Tokyo: Hokuseido, 1978. • Book of Serenity: One Hundred Zen Dialogues. Trans. Thomas Cleary. Hudson: Lindisfarne,1990. • Collcutt, Martin. Five Mountains: The Rinzai Zen Monastic Institution in Medieval Japan. Cambridge: Harvard UP, 1981. • Cultivating the Empty Field: The Silent Illumination of Zen Master Hongzhi. Trans. Taigen Daniel Leighton. San Francisco: Northpoint 1991. • Dogen’s Pure Standards for the Zen Community: A Translation of Eidhei Shingi. Trans. Taigen Daniel Leighton and Shohaku Okumura. Albany: State University of New York Press,1996. • Flowing Traces: Buddhism in the Literary and Visual Arts of Japan. Ed James H Sanford, et al. Princeton: Princeton UP, 1992. • The Gateless Barrier: The Wu-Men Kuan (Mumonkan). Trans. Robert Aitken. San Francisco, North Point, 1990. • Master Yumen: From the Record of the Chan Master “Gate of the Clouds”. Trans. Urs App. New York: Kodansha, 1994. • Moon in a Dewdrop: Writing of Zen Master Dogen. Ed. Kazuaki Tanahashi. San Francisco: Northpoint, 1985. • Mud and Water: A Collection of Talks by the Zen Master Bassui. Trans. Arthur Braverman. San Francisco: Northpoint, 1989. • Platform Sutra of the Sixth Patriarch. Trans. Philip B. Yampolsky. New York: Columbia UP, 1967. • Sasaki, Ruth F. The Record of Lin-Chi. Kyoto: Institute for Zen Studies, 1975. • Scripture of the Lotus Blossom of the Fine Dharma. Trans. Leon Hurvitz. New York: Columbia UP, 1976. • Suzuki, D. T. Essays in Zen Buddhism (First Series). 1953. London: Ryder, 1950. • Suzuki, D. T Essays in Zen Buddhism (Second Series). 1953. London: Rider, 1980. • Suzuki, D. T Essays in Zen Buddhism (Third Series). 1953. London: Rider, 1977. • Suzuki, D. T Manual of Zen Buddhism. New York: Grove, 1978. • Suzuki, D. T Zen and Japanese Culture. Tokyo: Tuttle, 1959. • Suzuki, D. T The Training of the Zen Buddhist Monk. Berkeley: Wingbow, 1974. • Suzuki, Shunryu. Zen Mind, Beginner’s Mind: Informal Talks on Ze Meditation and Practice. 1970. New York: Weatherhill, 1975. • Tanahashi, Kazuaki. Penetrating Laughter: Hakuin’s Zen & Art. New York: Overlook Press, 1984. • Uchiyama, Kosho. Opening the Hand of Thought: Approach to Zen. Trans. Shohaku Okumura and Tom Wright. London: Penguin/Arkana, 1993. • Unborn: The Life and Teaching of Zen Master Bankei. Trans. Norman Waddell. San Francisco: Northpoint, 1984. • Yamada, Mumon. How to Practice Zazen. Trans. Eshin Nishimura. Kyoto: Institute for Zen Studies, nd. • Yampolsky, Philip B. The Zen Master Hakuin. New York: Columbia UP, 1971. • Zen Dawn: Early Zen Texts from Tun Huang. Trans. J. C. Cleary. Boston: Shambhala, 1986. • Zen Forest: Saying of the Masters. Trans. Soiku Shigematsu. New York: Weatherhill, 1981. • Zen Teaching of Bodhidharma. Trans. Red Pine. San Francisco: Northpoint, 1989.